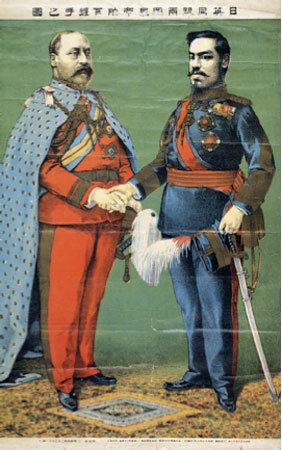 Emperors of the two countries of the Anglo-Japanese Alliance, 1905. What was the old alliance for, and why did it end? Russia: the original alliance was formed against Russia, and that threat had (particularly from the Anglo perspective) been addressed as early as 1907. Russia had fought on the same side as Britain and Japan in WWI. China: views on China had begun to diverge since before WWI (e.g. over the ‘open door’), and as Japan’s dominance was increased by the addition of former German possessions, Britain became increasingly reluctant to back Japan’s defence of its position in China against American pressure. America: Understanding of American strength reached through experience in WWI (as well as deep cultural affinities), convinced Britain that it would not fight America. After WWI, the only peer competitor that offered a rationale for the Royal Navy was Japan. Nationalism, Partly driven by US support for self-determination, was corroding the colonial form of empire in the 1920s. After WWII, America build a post-colonial form of Empire around the policy of containing the USSR, and a global network of alliances which structured the separation of Europe and Asia, and the UK and Japan. 2. World Order: WWII catalyzed the end of the colonial forms of empire that brought British and Japanese interests together in China, Korea and India. Instead we have state-directed commercial empires under the world order described in the UN Charter and a system of global economic governance (World Bank, IMF, G8, G20, etc). However, these structures of contemporary world order also offer incentives and channels for cooperation between allies. 3. Regional Integration – Then Britain was near its peak as a sovereign power. Now it is a part of a politico-economic union. Japan is not, but it conducts its diplomacy within a web of regional organizations (ARF, ASEAN+, EAS, etc.). These organizations may come to be regarded as the successor to older forms of empire. 4. America: The boot is truly on the other foot. 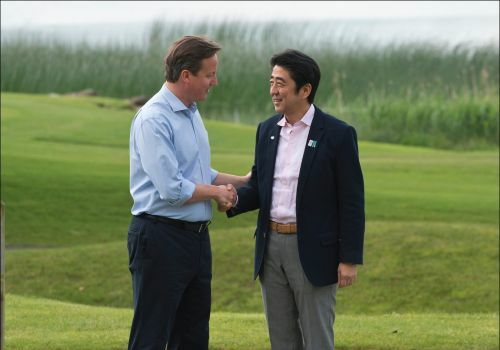 Britain and Japan are both junior partners in their separate alliances with America. But America is in relative decline (marked by the sequester, the ‘leading from behind’ approach’, challenges by Russia and China, etc. ), leading to wider questioning of its reliability as an ally. Is it time for Britain and Japan to ‘branch out‘ from their reliance on Uncle Sam? 5. China: The 1902 alliance was to some extent a product of the condition of China, which was a failing or collapsing state. The alliance was one way of addressing the risk of conflict between the great powers over the spoils of disorder in China and weakness in Korea. Now of course China is at the centre of interest in Asia, but for quite different reasons. The question then was how predatory powers organized their exploitation of China’s weakness. Now there is a common interest in how to maximize gains and reduce risks coming from China’s growing strength. 1. Geography: Britain and Japan are still far apart, and so a new form of alliance will still be constructed from the things that lie between / connect them: Russia, America and the oceans. 2. Geo-politics: as in the second period of the early Alliance (after 1905), relations with America are still coming between the UK and Japan. In the later stages of the alliance (particularly after WWI), many in Britain saw in the Alliance dangers of entanglement. One was the risk of having to side with Japan’s more ambitious position on China. Another was the difficulty of taking a position in the event of war between Japan and America. Today fears of entanglement (in a war with China, North Korea or even Russia) would count among the factors against a revival of a formal alliance or common security agreement between Britain and Japan. However, if an anti-China axis forms including the UK’s most important ally (US) and Japan, this could reinforce the logic of UK aligning with Japan on China. There is competition among European powers for commercial advantage and influence in Asia, as before. Putin’s Russia is acting in a way that may stimulate Europeans and Asians to cooperate again in managing relations with the Bear. 3. Role in the world order: despite their diminished capacities, both the UK and Japan express a desire to influence the world outside. Japan talks of its ‘international contribution’, the UK of being ‘a force for good’. Of course both countries have vastly reduced military capacity compared to the earlier era, but they are serious players in proportion to their size and maintain high standards in military technology. The aerospace sector is a good example. The vast scale of America’s military distorts the global scale somewhat, but below that level there are still few other nations with the capacity for power projection like the UK and Japan. What makes a new kind of alliance attractive? 2. World Order: The present world order (UN Security Council + free trade globalization) brings Anglo-Japanese interests together at the UN and through state-directed commerce. With Britain a permanent member of the UN Security Council and Japan a commercial superpower, the implications for shared interests are clear. 3. Regional integration – Britain’s membership of the EU makes it a useful channel to bring Japanese concerns to the table. Reciprocal advocacy may be enjoyed in a range of fora, such as ASEAN +, East Asia Forum, and NATO. 4. Alliances – Respective alliances with America are also a source of shared interest, the exploitation of which is a matter of the upmost delicacy. No doubt it helps when it comes to things like sharing intelligence and defence technology. The question of what form the new type of alliance should take is one to which I will return in future blog postings. I welcome your comments.